Thank you to AOL and Jeep® for sponsoring my writing. AOL is holding a contest where women can participate by uploading their own "Inspiration Board," which is a custom destination that allows women a chance to develop an online "Inspiration Board" chronicling all the things that represent her and what she aspires to become. This past weekend, I celebrated my 5-year college reunion from Columbia. I had such a great time both nights seeing old friends and classmates, hearing how everyone's life is going, dancing, and drinking lots of wine and champagne. 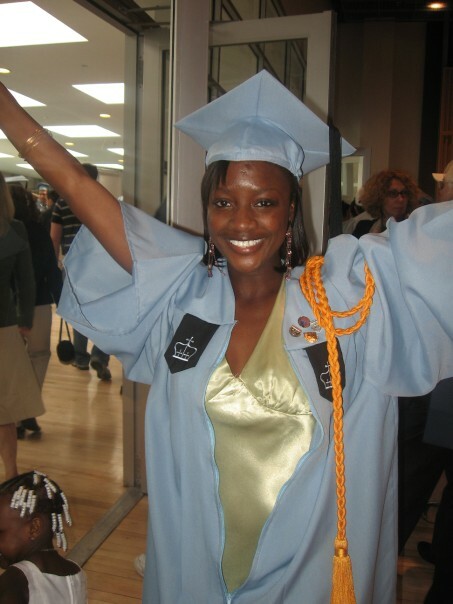 Naturally reunion weekend made me think of that lovely day at my Columbia Commencement five years ago. As I sat there listening to the keynote speaker, I remember feeling inspired about where life would take me. Up until that point, I'd endured so much and conquered so much and I was truly excited about, well, life. I didn't know where I'd end up working or where I'd end up living, but I was inspired to live a legendary life because of the possibilities. And because I knew that they were endless. Graduating in May 2006 with my B.A. Then I met Mr. Not-So-Right, did the deed, and had a baby all before I thought I was supposed to. And I thought that was the worst thing that could have happened to me at the time. Then I doubted myself and my judgement and my self-worth. And I thought that was the worst thing that could have happened to me. But then... I found myself in an abusive relationship. And I thought that was certainly the worst thing that could have happened to me. Turns out, it wasn't. In fact, none of those things were. The worst thing that could have happened -- that did happen to me -- was that I lost my inspiration. For more. For life. For endless possibilities. Having a foggy cloud over your head'll do that to ya! But it's always a good thing when you can get your inspiration back, when the foggy cloud over your head ceases to exist and ceases to control your life. It's always a good thing when you can think clearly and smile and laugh just because. Believe me, it's a very good thing. And I know now that life always turns out the way it's supposed to turn out. I firmly believe that everything happens when it's supposed to happen, the way it's supposed to happen. 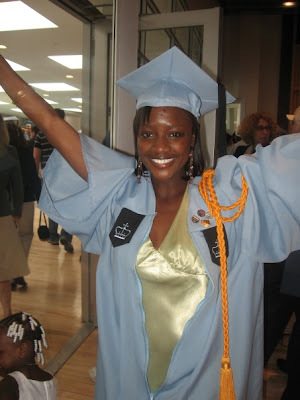 Graduating in May 2011 with my M.A. and Ed.M. Five years after graduating with my Bachelors degree, I find myself at that same place. At a crossroads, so to speak. 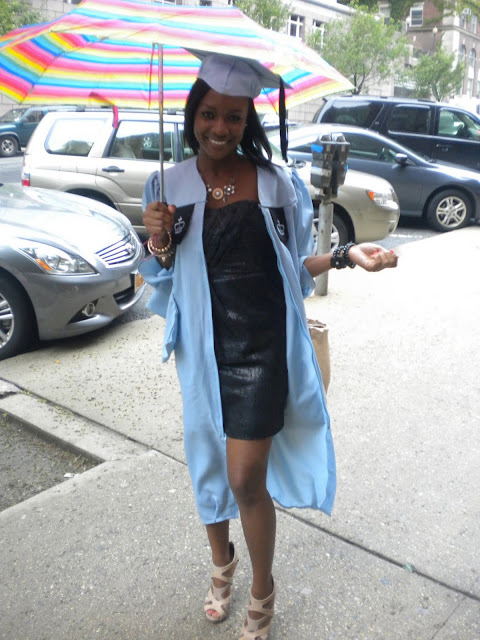 I've graduated from Columbia yet again, but this time with two Master degrees and I'm filled with the unknown. Where I'll end up living and where I'll end up working has yet to be unfolded. But yet still, I'm inspired. By the life that I have now. The life that I didn't think that I was supposed to have so soon. Motherhood. The life that has birthed and and nurtured and honed so many strong qualities within in. I feel competent in my abilities and confident in my decisions. Life may be uncertain, but it continually proves to be exciting and scary and all-around lovely... all wrapped up in one nice bow. I'm in a good place now. My life is full and fulfilling. I'm looking forward to this time in my life because now I've conquered even more and my pocket book is replete with very valuable life lessons from the life that I felt I wasn't supposed to have so soon. And I, I couldn't ask for anything more but a little more inspiration to live a legendary life. Disclaimer: This post was sponsored by AOL. Head on over to AOL in order to participate in the "Inspiration Board" contest for a chance to be entered to win a random sweepstake rewarding a $50 gift card weekly, and a chance to win the Grand Prize of a $4500 gift card. "Life may be uncertain, but it continually proves to be exciting and scary and all-around lovely... all wrapped up in one nice bow." Love this! So true! Life is definitely uncertain, it is all about what you make of it. The world has not seen you yet! Amen!!! that you have endured and conquered so much. You are a force to be reckoned with, for sure. Im definitely inspired by my boys, and wanting to be a role model to them, the way my parents were for me and my siblings. You are so amazing! You have conquered so much and you have much to be proud of! Life is so much easier when we reach that point of accepting that everything happens when it is supposed to. Same doll. You have to find that inspiration, everyday, in everything. I just love your spirit! I feel the same way about my life. Some of what we go through is not easy or welcomed by us but I know for sure that these are are only Caterpillar experiences, they force us to grow and develop our wings. Its an honor to watch you fly. Love it! And yes, everything happens for a reason and we are better because of it. My son inspires me. And I am inspired by life. I know that there are endless possibilities out there. What a wonderful post. Thank you for sharing your inspiration. After 10 long years of depression and directionlessness, being a mama to my son is what inspires me. Having him truly changed my life. For years, I felt I had no purpose, no meaning. But now I know why I was put on this earth - to take care of him! Knowing that, everything else just kind of falls into place! Oh the places you will go! (In my Dr. Seuss voice) Let nothing stand in your way. Actually you haven't and you've encouraged so many of us along the way. I can't wait for the day I'm posing in my graduation gown and hooded. Keep inspiring! I agree that everything happens for a reason. Sometimes we get uninspired in order for us to get re-inspired ten times more than we were before. You are certainly going places. Glad that you found your inspiration.